Any good warm-up should include aspects of the main event. 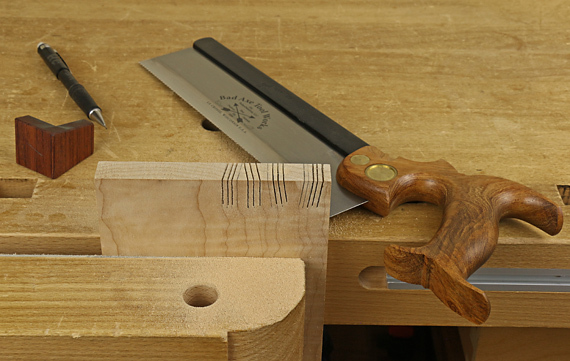 To prepare for sawing dovetails, for example, saw to a series of lines that mimic dovetails. As you begin, recall and concentrate on basic technique and mechanics without being primarily concerned about hitting the lines perfectly. You’re like a baseball player before a game, at first taking easy batting practice pitches while just trying to execute sound form and make good contact. Address any neglect of the fundamentals. Then bear down and try to make a couple of dead-on cuts. Observe the results, sharpen your mind, and clean up your technique accordingly. Find your familiar physical and mental groove. Make sure there are no deficiencies in your tools and setup, including the lighting. The warm-up also gives you a chance to sense the density and grain of the particular wood at hand and make appropriate adjustments in technique. For work that you do frequently, the warm-up should be very brief. Even if you’re a bit rusty, it should only take a few minutes, provided your skills are fundamentally sound. Only when the core – glutes, hips, upper back – is strong, engaged, and balanced, can the peripheral parts – shoulder, arm, and hands – move with accuracy and precision. Try this exercise. 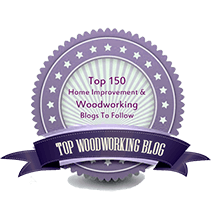 Make a small, shallow pile of sawdust on your benchtop or scrap of wood. Attempt to create “kerfs” in the pile by pushing the dust with the teeth of your saw without the teeth making contact with the benchtop. It can only be done with your core muscles engaged, along with a balanced stance. 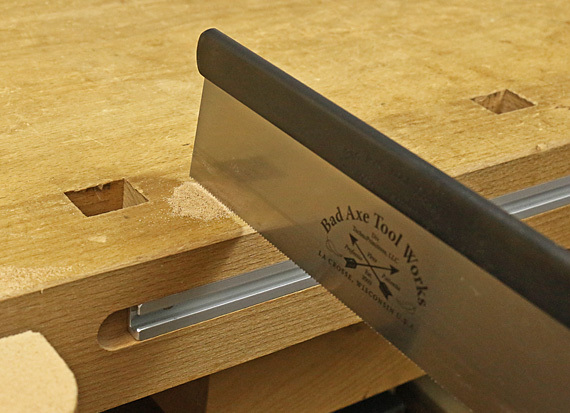 When sawing joinery with a backsaw, the saw should not be helping to support you. If it is, it is being partly diverted from its primary function, which is to make a kerf, and it won’t be as consistently accurate. The hand without the saw can rest on the bench or work piece to aid in balance. It should bear the weight of no more than itself and the arm. By the way, core activation does not mean being stiff. Think of the shock absorbers on a car. They are very strong but allow movement, always maintaining an equilibrium that allows all the other parts of the car to function smoothly and precisely. This discussion is about sawing with a backsaw but even with a handsaw where the entire body moves more, the core is still in primary control of all the motions. Note to readers: Uncommon tips 1-6 can be found here. More on the way. Great tip about moving the sawdust with the teeth. Regarding using your core I couldn’t agree more. It’s the first thing I try to impart to people about using a shooting board (https://www.youtube.com/watch?v=VYaLaGJQj08) and paring with a chisel. As tennis players and guitar players, you and I have the benefit of understanding how to use the body in ways that really translate into using the body for both power and control. Yea, Tico, shooting and paring are two more good examples where core control is essential. BTW, for me, it’s “former” for both of those non-woodworking activities. Readers, watch in Tico’s video at 3:22, 4:11, and 4:40 the controlled power he transmits to the plane and work piece by engaging his entire body from the floor up. 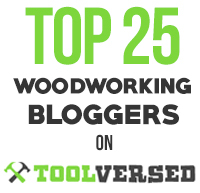 And by the way, wow, Tico and Tom Fidgen are the only woodworkers I know of who compose and perform their own musical accompaniment to their woodworking videos demonstrating tools that they have designed and constructed. It almost seems unfair for so much talent to reside in some people. Hi Rob, I really wanted to respond to the photos and text in #2 but I see you’ve got comments turned off. Is there any way you can accept a few words on this? I love your approach to these matters and think I could contribute something useful. I’m a teacher of the Alexander Technique (and a very, very amateur woodworker). I welcome your comments. I currently limit the comment period to one year after posting to reduce the clutter in the spam-catching plugin and to reduce the number of missed spam. Please enter your comments here or email them to me and I’ll add them to the #2 post in the series. I’m looking forward to your comments. By the way, since I wrote that #2 post, I no longer use the Moxon vise, but the principles are the same.